One of the most influential fictional detectives, Hercule Poirot, achieved a unique fame during his literary life. Created by Agatha Christie, he appeared in thirty-three novels, numerous more short stories, and upon his death became the only fictional character whose obituary was published in The New York Times. Although his creator despised him as a character, Poirot’s fans loved him. Recently, Poirot died a second time with the final portrayal by David Suchet, who played the Belgian detective in an adaptation of every story Christie wrote about him, ending a lengthy career with his final story, Curtain: Poirot’s Last Case. Poirot may not be the most famous fictional detective. He has not entered popular culture the way Sherlock Holmes has; Christie, unlike Arthur Conan Doyle, did not choose to bring him back from his death, making his demise far more permanent than Holmes’s. But he is one of the most important detectives in the genre, relying on his “little grey cells” and watching the world with a meticulous eye. Perpetually calculating, though always a gentleman, he is far from the theatrically awkward, over-the-top socially inept kind of detective so common today, ranging from Batman to Dexter Morgan. Instead, Poirot falls into the believably quirky set of detectives, Miss Marple, Inspector Morse, Nero Wolfe, and Colombo. He is self-assured, confident, slightly neurotic, easily discomforted, and obsessive. His fans love him for many of the same reasons Christie hated him. For many Poirot fans including myself, it is impossible to think of the detective without also thinking of Suchet’s portrayal. When I read Christie’s novels and stories, I hear Suchet’s light, Belgian accent, his distinct articulation, and his intonation whenever Poirot speaks. I picture Suchet with a curled mustache, cautious eyes, and fine suit when I read Poirot’s descriptions. 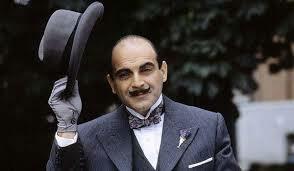 Like many Poirot fans, I watched Suchet’s final performance with great difficulty because I knew it was his last act. But his adaptation is so fine-tuned after decades of practice, watching Poirot wither away in a wheelchair and struggle to solve an impossible case made me cringe. I know it was only an adaptation, but I would like to think that Suchet would have made Christie admire her Belgian detective, even though she loathed him by the end. Bringing Poirot to life was Suchet’s magnum opus as an actor, or so I thought. Now I know the importance of bringing a character to death, to place him in the grave with dignity, to do justice to his final breaths and make audiences lament their loss. Suchet prompted such a lament. This entry was posted in Literature, Writing and tagged Agatha Christie, BBC, character, crime fiction, David Suchet, detective, Hercule Poirot, literature, Mystery on November 26, 2014 by keeneshort.